After finishing my recent post on essential oils and cats, there was a bit of an uproar in the canine community: “Howl about me? Yip, yip, howl can we use oils?” So this post on essential oils and dogs is just for you and your canine companions. 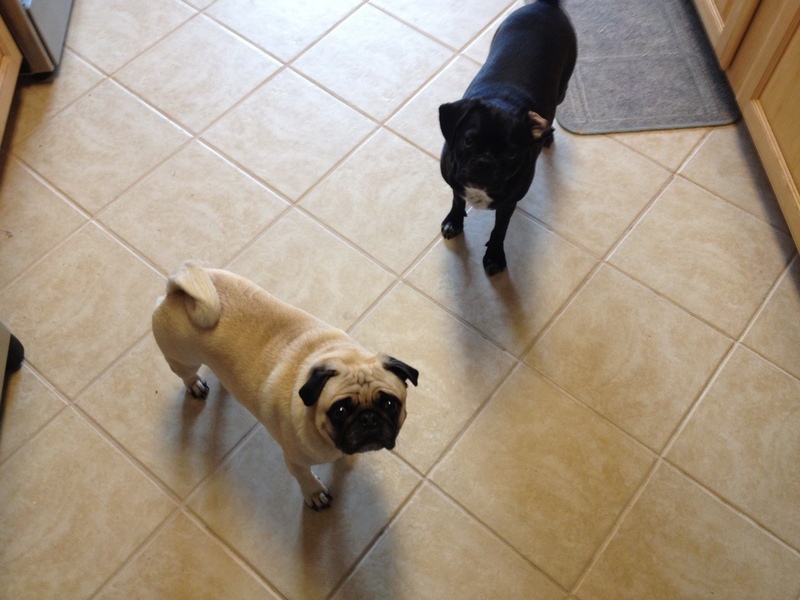 We love being able to support our pugs using essential oils and you should too! There has been just as much confusion and polarizing information online about the use of essential oils and dogs —perhaps more. So it’s time to take a closer look at verifiable information related to the use of essential oils with or around some of our best friends! Just as cats are unique, and must be cared for in ways unique to their makeup, so too are dogs. Not only are they unique as a species, but there are many different sizes of dogs, so each dog must be cared for uniquely. Essential oils can safely be used with dogs, if you follow the specific guidelines for safe usage. So let’s take a look at some guidelines for safe usage. Not all essential oils are created equally! Online sites, including Amazon, are loaded with fake or watered-down or polluted essential oils. High-quality essential oils can greatly benefit your pet. Because essential oils are lipid soluble distilled from plants, they can be absorbed into cells through the cell membrane. When choosing an essential oil to use with your dog, first carefully consider the quality of the essential oil. Has it been third party tested? Is it a pharmaceutical grade EO that is safe to use topically or internally? Have you consulted with your veterinarian to be sure there are no underlying reasons why it might be unsafe to use essential oils with your dog? Never use aromatherapy or perfume grade essential oils on with your dog. Use only the therapeutic grade essential oils. I highly recommend dōTERRA essential oils because they have more stringent testing and purity/quality checks that any other company. But even dōTERRA oils must be purchased through a Wellness Advocate (not amazon) to be sure you are getting the genuine oils. Here’s my unbiased tips to look for when buying essential oils. Use the recommended dosage for your specific dog. Dogs cannot metabolize essential oils as quickly as humans, so the essential oils should always be diluted before using. Remember, that in general the smaller the dog, the more you want to dilute the essential oil with a carrier oil. A suggested dilution for a mid-sized dog would be to use 3-5 drops and dilute it 80-90 percent in a carrier oil. Dogs are more sensitive to essential oils than humans are. Essential oils should always be used diluted, even when just inhaling. This is important to remember, as we humans don’t dilute when inhaling directly out of the bottle. Water diffusion is an excellent way to use essential oils through inhalation with your pups. Most issues that dogs have can be addressed with the inhalation of diluted essential oils. Only use essential oils with your dog when needed to address a concern—not to “prevent” a health issue. An example is to have them inhale a digestive essential oil after they eat, when they don’t have any digestive issues. This is not recommended. Do not add essential oils to your dog’s food or drinking water for no reason. See internal application method below for more details on this. Avoid using essential oils with puppies under 10 weeks of age—use hydrosols instead. Avoid the eyes, nose, and genital areas. The most common ways to use essential oils with your dog is: topically, aromatically, and internally. Use extreme caution when you begin. Just as you slowly introduce new food to your dog, so too introduce essential oils slowly. Start with a small amount, and watch your dog’s behavior. If there is no negative response, but no visible therapeutic effect, you can slowly increase the frequency of application. Each dog has a unique body chemistry, and can tolerate essential oils to a different extent. Water diffusion is the recommended aromatic application. Start with 1-5 drops of oil in your diffuser. Monitor your pet’s behavior during the diffusion and always leave a door open in the room you are diffusing so your dog can leave the room if he wants to. Rub along the spine—this is the most common and best tolerated application. Add some of your carrier oil to the palm of your hand, and then add 1-2 drops of your essential oil. Then rub your pup along his/her spine, as normal. Ear tipping—apply to the tips of your pet’s ears. Avoid this method with long-eared dogs because they may shake their head and get the oil in their eyes accidentally. Apply to the paws—this is not always well tolerated in small dogs. Be sure to get it on the skin between the paw pads, but be sure to dilute the oils because this is a fairly sensitive area. Water misting—this is helpful for covering a larger area, such as when you may be misting with a homemade flea solution using essential oils. Exercise caution when using this method. Be sure your dog has no underlying medical condition that might cause problems with internal application of essential oils. If you and your vet feel it is safe to use internal application, a recommended dosage is 1 drop in 2 cups of drinking water or 1 drop mixed with some fish oil and drizzled on wet dog food. If using in food, use in wet food only. Remember that because your dog grooms frequently, in most cases topical application also means internal application. For that reason always use diluted essential oils. There are many other essential oils that may be safe for your pet. Try letting your dog choose the essential oil. Animals like dogs and horses will use their sense of smell to choose plants to eat when they need them for medicinal purposes. Try offering them different oils to smell. Their sense of smell is so precise, you do not need to open the bottle. Most dogs will lick the air repeatedly, which is part of their process of smelling. A dog will turn away from the oil he does not want, and try to lick the bottle or stand close to the one he chooses. Essential oils enter the bloodstream quickly. The most important consideration is to use only pure, high-quality essential oils. It is fairly easy to spot signs of trouble in how your dog responds. Watch for loss of appetite and trouble urinating, your pet may exhibit running eyes, vomiting, excessive panting, rubbing face, muscle tremors, diarrhea, rashes and drooling. Allergies—it is recommended that you work with your vet to determine the source of the allergy, since addressing the root cause will help to prevent the itching. Recommended oils are frankincense, lemon, lavender, and peppermint. Ear Infections—cleaning the ears regularly with a natural ear cleaner is essential. Recommended oils are diluted frankincense, geranium, lavender and basil. Seizures—a recommended oil to use is frankincense. Transitions—use when bringing a puppy home, transitions between homes, or adding a new animal. Recommended oils: lavender and myrrh. Mix in a glass roller ball bottle, and rub the roller on the area, and then massage. Add ingredients to 8-oz. glass bottle, fill with water, and shake well before using. Add to an 8-oz. glass spray bottle, fill with water, and shake well before spraying. Try spraying the mist into your palms and massaging your dog’s neck, back and chest to help them relax. Essential oils have so many benefits for dogs, and can work wonders. Be sure you are offering your canine best friend this natural, beneficial option for addressing health and wellness concerns. Just be sure to do your research, and do not go essential oil crazy. I recommend that you begin by using an essential oil with your dog for about two weeks, and then give your dog a break for two to three weeks. Watch out for signs of problems and monitor your pet’s behavior. Most importantly, listen to your dog, and don’t force an essential oil on your pet. Always consult your vet if you experience symptoms or issues you cannot understand or resolve. Dr. Janet Roark, DVM, is a veterinarian with a specialty in Veterinary Aromatic Medicine. She has multiple resources available at: https://www.facebook.com/EODVM/, and online at: http://essentialoilvet.com/about/. Dr. Eric Zielinski (“Dr. Z”) is trained as an aromatherapist, public health researcher and chiropractor, and has become the #1 source for Biblical Health and non-branded essential oils education. He can be accessed at: https://drericz.com/essential-oils-for-dogs/. “DoTERRA Essential oils for dogs,” available at: https://healinginourhomes.com/essential-oils-for-dogs/. Nayana Morag has a specialty in Animal Aromatherapy, and has studied Ttouch, animal acupressure, 5 element theory, and Aromatic Energetics and Kinesiology. She has available an Animal PsychAromatica Online course, available at: https://www.essentialanimals.com/courses/introduction-essential-oils-horses-dogs-online-course/. One of the statements I can remember my mother saying whenever she counseled with someone about a problem in a marriage relationship was: “You have to always remember that you bought the farm!” So what does that mean? It means that in relationships, just as in farming there are cute, cuddly animals and bountiful harvests; there are also weeds, predators after your chickens, fleas and ticks on your barnyard animals (and sometimes your kids), and lots of manure to deal with. However, I’m coming to realize that essential oils can be used for so many things and so in this post I’m going to share with you how to use essential oils on a farm. I know that truth a lot better today after just a few short years of homesteading, than I knew it in my head before I experienced it…homesteading is NOT easy, nor is it glorious. I want this post to help us find ways that we can deal with some of the more negative factors in homesteading through the use of essential oils. Yes, that’s right, you can use essential oils on your livestock and in the care and management of your farm. But you don’t just start using essential oils indiscriminately wherever and however you choose. Just as you want only to better the health of your family members with your essential oils, so too that’s your goal with your animal family, and it takes a bit of forethought and knowledge to get it right. If you are interested in my trusted brand and how to get started using essential oils, then CLICK HERE! OK, I know we are not choosing to raise flies, fleas and ticks, but every barnyard animal will have to do battle with these pests. Flies are a major health concern all across the globe. The common housefly is a serious threat to people and animals alike because of the many infectious diseases they carry. Fleas and ticks like blood of any flavor—human, animal, or poultry. Researchers in India did studies testing essential oil usage for dealing with flies. They discovered that peppermint oil successfully repelled larvae and egg laying, with ginger oil, cinnamon oil, and gooseberry oil also giving respectable assistance. (Source) You can find a Homemade Fly Spray Recipe using essential oils here. Finding a nontoxic insect repellent to use on your barnyard animals is not easy. Chemicals like prallethrin and piperonyl butoxide are often used in livestock sprays, as well as the proven toxic chemical, deet. These chemicals accumulate in the liver and put our animals at risk. However, researchers seeking organic and naturally healthier ways to get rid of insects and have developed nontoxic sprays using essential oils. You can find four of these natural livestock spray recipes here. There is a wealth of helpful research available online to help you find nontoxic, natural solutions for the health problems experienced by your household pets. It is important to remember that the essential oils blends and aromatherapy that humans can enjoy and handle might not produce the same reaction in our pets. Some oils can be quite dangerous. If used correctly, however, essential oils contain a host of biologically active and powerful compounds and are an indispensable part of integrative medical care. (Source) You will need to research carefully to learn how to successfully use essential oils on your pets. Once you are familiar with the essential oils safe for your pets, you can begin to develop essential oil remedies. You can find several suggestions for sprays, shampoo, flea collars, ear problems, paw pad care, skin irritations, doggie smell deodorizer, and calming mists here. A buildup of fumes from chicken droppings, spilled water and cleaning products irritates their breathing system and leads to illness. So using a coop cleaner made with natural products will clean the coop without irritating the chicken’s respiratory system. Lemon essential oil and other citrus fruits have natural cleaning and disinfecting capabilities. You can easily make a homemade coop cleaner that is easy on your nose and easy on the chicken’s respiratory tract. Use the recipe you will here for cleaning out the old shavings and coop bedding, and to spray down the coop. You can also make a salve ointment with essential oils for chicken care. You will find one recipe using lavender and frankincense essential oils here. Coconut oil is also a great carrier oil to use for homemade chicken ointment. Heavily diluted oregano essential oil is used by many chicken owners for many uses. Using essential oils for chicken care is a wonderful natural approach. Just make sure you do your own research so you are comfortable with the choice that is right for you to use. You can also find a recipe for Natural Garlic Juice Spray here. We like to add a few cloves of garlic to our chickens waterer. The garlic infuses the water and provides a good immune support every time they take a drink of water. If a goat is being kept in a stall due to illness, you can put drops of oil around the stall to help eliminate some of the animal’s stress. Some goat farmers will also add a few drops to a vaporizer or diffuser to alleviate respiratory issues. Lavender oil can be very hard on the liver and kidneys of animals, so avoid internal use. You can research all aspects of raising goats here. Essential oils can benefit cattle during summer months with heat stress and pesky insects. Flies, fleas, and lice irritate cattle. Strongly scented essential oils like rosemary, cedar, lavender, and eucalyptus naturally repel pests and lessen the stress on the herd. Cinnamon oil, known as a “hot oil,” and along with garlic oil, clove oil, and oregano oil can help to reduce fermented protein in the rumen. Garlic oil can help to relieve digestive upset and the production of methane gases. You can find specific instructions for their use here. It’s so encouraging to Frank and I as newbies in the business of raising farm animals to find that more and more farms are putting essential oils into practice. A number of companies are even selling plant extracts as feed additives, but very few big companies are willing to readily offer that information. Essential oils are truly a secret weapon, an unsung hero being used successfully, but not quite openly. Our farm plans to continue openly trying to find more and more uses for these powerhouse essential oils in our farmyard. I know that by now you have seen the many pictures I have posted of our wonderful Livestock Guardian dog, a beautiful Great Pyrenees named Esme. She has been a great addition to our family, and by now, at more than eighteen months of age, she has developed into a fantastic guardian dog for our goats and chickens. The care and training of a Livestock Guardian Dog is an investment that will NOT disappoint, as long as you do it the right way. Great Pyrenees are one of the oldest dog breeds in the world. They were bred as dogs of war and then used during peacetime as sheep guarding dogs. They are one of the least aggressive of the large guardian dogs (LGD), so often people cherish them as family dogs. They are regal, independent and aloof compared to other dogs breeds, traits necessary to spend days alone guarding flocks. This independence shows when you call them—they come, but maybe not on the first call. Raising a livestock guardian dog is much different than raising a pet dog who lives with you in your home. Making the right decisions in the period of training will guarantee that you livestock dog performs his duties perfectly for the rest of his life. But choosing to raise him as a pet with little or no specific guardian training will give you a dog who cannot be trusted with your livestock. Raising puppies to become livestock guardian dogs is a 12 month to 18 month venture. These breeds of dogs are slow to mature and thus are often not trustworthy and reliable before this age. I want to take a brief look at three major areas of training for a livestock guardian dog. How do I teach my livestock guardian dog to bond with my livestock? How does my livestock guardian dog learn to obey fence and gate boundaries? How do I socialize my livestock guardian dog to people and my surroundings? Livestock guardian breeds come with an inherent ability to guard that which they bond to. When you bring your pup home be prepared for him to spend the night where you expect him to spend his nights as an adult. With the stock. Not in your house. Every day the pup will need to exercise and have interaction with his charges. You can allow free time outside the puppy pen whenever you are around to keep an eye on the action. For the first few weeks, lock the pup up when you are not there to supervise. During the small puppy-stage (which doesn’t last long in a Great Pyrenees) we used a large dog kennel and kept it in the barn with the goats. Our Esme slept in the large dog kennel at night and during the day we put her in a separate fenced section. She could smell and be out with the goats and chickens, but the fence kept her from developing any bad habits of chasing the livestock. NEVER throw your puppy in with your livestock and expect him to naturally take on the role of a Livestock Guardian Dog. A Great Pyrenees does NOT equal a good Livestock Guardian Dog. A well-trained and time-invested Great Pyrenees DOES! Over the next several months supervise the pup and discipline any unwanted action toward the animals such as chasing, chewing, and biting. And by discipline, I do not mean you EVER hit or kick a livestock guardian dog. This will leave a bad impression and could ruin the demeanor of the dog forever. You firmly say, “NO…my chickens,” and then walk away from the dog and show them no attention. If they continue to misbehave, you lock them in their pen (which they utterly hate). You can also praise the pup for good behavior. Pet and feed the pup when he is with the livestock, not when he is away from them so that he never develops the bad habit of being possessive of his food. Do not take the pup up to the house for food and attention. As the pup matures you will notice if he is bonding to your livestock or not. If the dog is to guard, it is not good to raise it around other non-Great Pyrenees dogs where it can pick up bad habits such as chasing poultry or livestock. Great Pyrenees don’t normally chase, but if the big puppy bounces up to a chicken and the chicken runs the other way, the dog will give bounce after it. Once chasing starts, the chicken soon becomes a diversion, and that dog can no longer be trusted with poultry. Closely monitor your Great Pyrenees puppy for its first 12-24 months if you desire to raise a trustworthy poultry guard. Some dogs take 2 years to become trustworthy around chickens. We found that Esme took 15 months till we were confident in leaving her alone with the chickens but the training was SOOOOOO worth it. A large part of success with raising puppies is being able to teach them to respect boundaries. Under no circumstances is climbing over or crawling under the fences going to work. Supervise and correct any attempts to go over or dig under fences as you see them. Use the time that you have the dog nearby and bonding to stock to set up the enclosure with hot wires, and allow the dog to learn the consequences of crossing electric fences. Gates also need to be included in the training. LGD’s are smart dogs and will figure out that fences may be not so good but gates are okay. They need to know they do not cross gates unless invited out by you or moving with the flock. When raising puppies doing the work of teaching the pup respect for fences will go a long way to eliminating the core problem seen in LGD’s—wandering away from the flock and farm. Adult Great Pyrenees will naturally cover a one to two mile radius. If that’s not allowable, the dog will have to be trained to a smaller area. Fences, electric fences, and invisible fences all work good. Neutering helps to keep a male dog at home. Close supervision and correction the first two years will help yield a dog that stays within the property lines. When you bring your new puppy home, make sure you walk the perimeter of your property every day for a few weeks so that pup understands it’s boundaries. The calm nature of Great Pyrenees livestock guardian dogs around livestock, combined with proper training, will bring out the naturally gentle and submissive breeding that makes these dogs a wondrous thing to behold around small and delicate kids and lambs. However, we need to always remember that these dogs aren’t bred for obedience. Patience is a must. We expect our LGDs to think and react when we aren’t there to protect our flock. We cannot simultaneously expect independent thinking and mindless obedience. These dogs are ALWAYS multitasking; they are bred to reject human instructions where they see a better way to behave. This is what makes them the perfect pasture companions to our chickens, sheep, goats, cattle and even horses. This is also why we have trouble with them obeying fencelines and expanding their territory. They are good at what they do, and they know it. Be patient with them and they will be everything you expect, and then some. Some livestock guardian dog trainers believe that LGD pups should be raised with the livestock they will be guarding, isolated from humans. In reality, this is an exaggeration of recommendations made by scientists in the USDA bulletin about selecting, raising, and using LGDs. The publication’s language about minimizing the dog-to-human bond has been incorrectly interpreted to mean elimination of contact with humans. Training cannot be accomplished without human contact. We love, pet, show affection to our Esme, and in return, we have seen that nurturing blossom into an incredible human-dog bond. Livestock guardian dogs are working dogs and a balance of how much interaction to have with the dog must be found. Be wary of how much attention you foster on the pup. The idea is not to make him into a pet but to let him know your touch by petting him and handling him. Let him know you control the food, and the access to stock and you set the boundaries. LGD’s grow into large independent natured dogs. You will need to stay on top of the pecking order, not by using force but by quietly assuming the role because it is your place and your stock and your duty to keep everyone safe. Great Pyrenees generally stay in good health. Some more common problems may include mats in the fur (especially around the neck and ears), the double dew claws growing too long, ear infections (due to dirt and moisture in the ear), eye infections (pink eye), allergies and “hot spots”. Hot spots are caused when an area of the skin becomes inflamed. The fur will fall out, the skin will turn bright red and the dog wants to bite at it. Some ointment from the Vet and keeping the spot dry cures this problem or a mixture of lavender and melaleuca essential oils mixed into a all purpose salve (here’s my recipe I use). Genetic problems include: underbite, entropia (small eyeballs), seizures and hip dysplaysia. Pronounced underbite shows up as wet spots under the chin and neck. Entropia is when the eyeballs are small for the socket size and the eye lashes stick inward causing irritation. This can be cured with simple surgery, but the dog should not be used for breeding. The cause of seizures is unknown, but from what we have heard, changing owners, being confined to a small area, or other highly stressful situations will tend to bring them on. Hip dysplasia is not quite as common as in other breeds because Great Pyrenees have not been over bred. The most common form of death that we hear about is being hit by a car or being stolen. We had to have stomach surgery on our Esme due to the fact she ate two rocks that got lodged in her stomach and small intestine. Thankfully, she made a full recovery! We corrected this behavior by providing her plenty of raw marrow bones to chew on in the late puppy stage and continuing to feed her a large breed high quality puppy chow to supplement the raw feeding that we do with her when we have extra meat laying around. Investing in a Livestock Guardian Dog was the BEST decision we made when we started our homestead. We found our puppy on Craigslist and she came from a working farm with working parents. We have invested hours of training into her and I couldn’t imagine our farm without her. The ultimate satisfaction of this investment comes when I look out the window and I see her laying down near where the goats are grazing and our free-range chickens are pecking happily in the dirt beside her. I have stepped into a new world of raw feeding my dogs. It’s something that I have been interested in for months. In fact, I have almost felt convicted when it comes to my dogs. My family eats so clean and Paleo, but twice a day I find myself pouring kibble out of a bag down for my dogs. I started to feel guilty in a way. I didn’t even think there was another way that I can afford. Since our children were born, we have had to discontinue the use of $50 bags of high-end dog food. I thought since it was expensive, then it must be good. Well, not so much. Dogs are carnivores. If out in the wild, they would live on a diet high in raw meat. It’s only when we started to socialize dogs with humans that processed “dog-food” came about. And even if you were to look at the ingredients of a bag of dog-food, you would find that it would be mostly grains and veggies…with some meat fillers. Poor doggies! So, that’s how my quest for finding the proper nutrition for my dogs began. I’ve heard of raw-feeding but I thought I could never do that. I have no idea why, but all I needed was the “push” to get me started on this path. Yesterday, a natural group that I am in on Facebook started talking about raw-feeding. My mind couldn’t grasp it because it seemed too easy. I mean, seriously, you just throw a piece of raw chicken (bone-in) down for the dogs to eat? What about the bones splintering? What about the bacteria? What about them becoming blood-thirsty and possibly devouring my leg in my sleep? Whatever, I’m doing it. 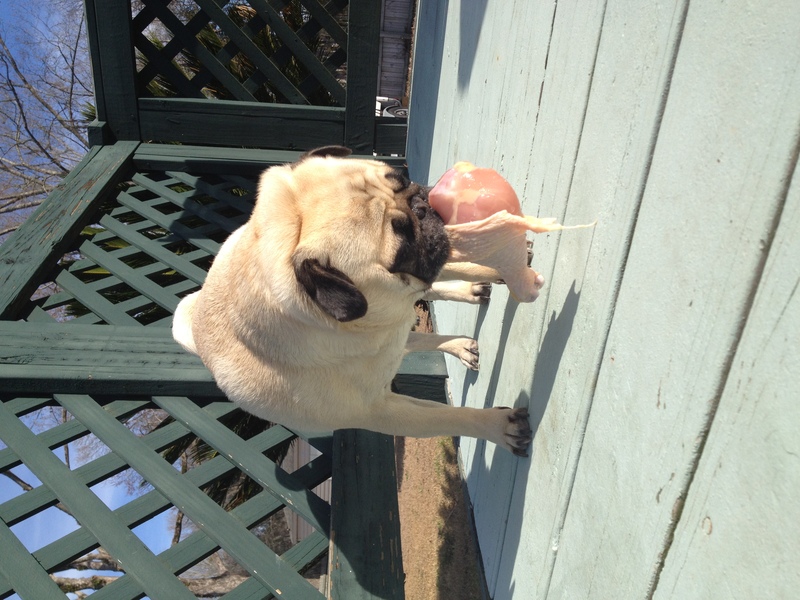 I threw a chicken leg down for my fawn colored pug and a chicken thigh down for my black pug. They spent the next 30 minutes eating it, enjoying it, savoring it. It was the first real food they had EVER had. I almost cried. I saw the pleasure and delight in their eyes. You know when you bite into a savory, perfectly-cooked steak? The “oh-my-goodness-this-is-the-best-thing-I-have-ever-ate” feeling that you get? I actually feel like they love me more now. Last night my fawn pug, Samson, became more lively than I have ever seen him. He is my dog that hates eating. I would put kibble in his bowl in the morning and he would finally eat it at 8pm that night when his stomach became so fiercly hungry. I just figured he didn’t need much food. When I gave him the chicken leg it actually took him like 20 minutes to figure out how to hold the leg with his paws so he could tear away the meat! In less than 24 hours I have noticed a huge difference in him. I’m not sure on all the proper methods of raw-feeding, but I plan on following the Prey Model diet for dogs. This is 5-10% organs, 10-15% edible bones, and 80-85% edible meat. The models and resembles, as closely as possible, what carnivorous canines have been eating for thousands of years. Raw-feeding also seems like it’s going to be cheaper than feeding packaged dog-food. 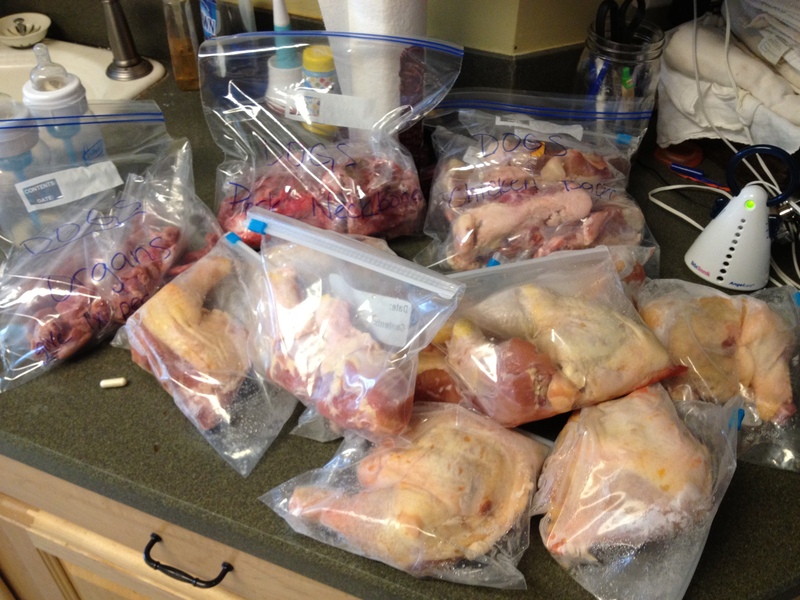 Yesterday I bought 10lbs of chicken, 2lbs of chicken organs, 3lbs of pork necks, and 3lbs of chicken backs (with meat) for under $15. This should last them a little over 3 weeks. I also plan on giving them some kefir every morning to help assist with the digestion of this new diet. Today as I was portioning the organs they got a few chicken hearts and split a big can of sardines! Needless to say, I am their hero!